The past year was busy and challenging for this graphic designer in the Ottawa area. Happy New Year! A few days late, but who’s counting! Like I did last year, I took some time on New Year’s Day to look back over the wide variety of interesting graphic design jobs I was able to work on this past year, mostly in the Ottawa area but also in Toronto and even further afield. The number of logos I designed was down, but the illustration tally was up. Since those are two of my very favourite things to design, I’m a very happy camper either way. Just for fun, I thought I would give you all a brief overview of some of the projects I was lucky enough to work on, chosen for variety of business streams and design diversity. 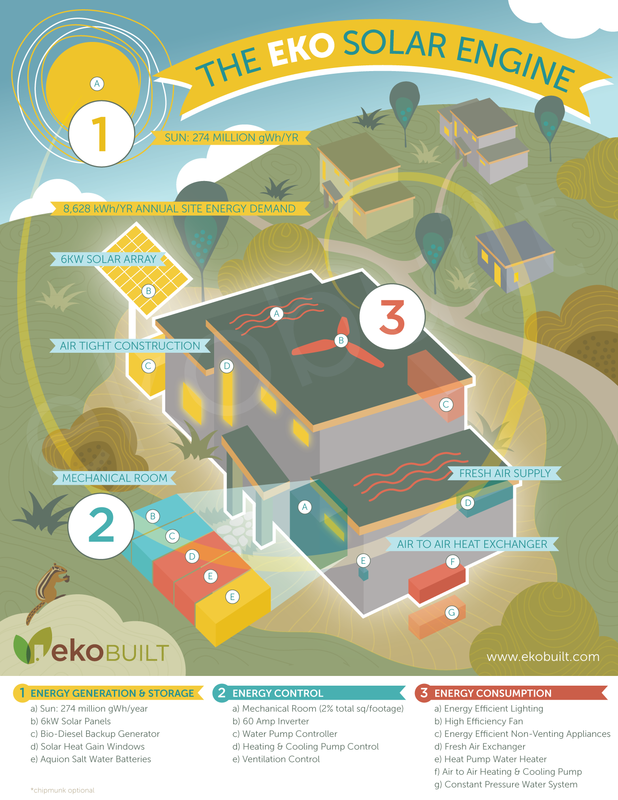 Illustration showing the component parts of the passive house building solution offered at EkoBuilt. A passive house, requiring no furnace, allows its residents to live off grid if required. The infographic has been designed to convey a wealth of information in a quick and simple way. A great deal of thought and planning went into deciding what elements went where, how to keep the illustration simple while providing maximum information, and of course ensuring that the finished piece was inviting to look at. Foil Media and Sumack Loft designed and produced new branding and online presence (previously here) for CWA, Canada’s oldest media union. Its old website was antiquated, and with no underlying database, everything was manually archived and referenced. A fresh and relevant new visual identity was developed, along with a new website which is accessible, effective, responsive, easy to update, and integrated with Twitter and Facebook, graphics for which were also designed at Sumack Loft. This Ottawa custom log home building company needed an updated logo and website to excel in today’s marketplace (previously here). The new logo shows a seamless integration into the environment, a sense of living lightly, with a small carbon footprint. With my colleagues at Foil Media, we also designed and built a new website for Paul and Adam with a fresh design that puts a big focus on photography – separating them from their competition whose sites are often dark and cluttered – and which features an active blog. Crooked Mile Brewing Company opened in Almonte in October 2016, and it wasn’t long before they teamed up with me at Sumack Loft to produce can artwork for their five flagship beers. The most elaborate illustrative project I’ve ever been involved in. Each illustration is based on a place in the UK which Vicki and Nick, two of the three owners at Crooked Mile, visited on a walking tour in 2006. We chose a character to grace each can that would typically be found in the areas depicted. I am very proud of this piece of work, and the beer is pretty great too! You can see all five illustrations on my illustration portfolio page here. Long established as one of the top designers in the field of Irish dance, Michelle Lewis recently came to us to help revitalize a brand that had been critically overtaken by some of the big names in the industry – an opportunity to rebrand with a compelling new business name: Phoenix Designs. A powerful new visual identity was created for Michelle, an easy to navigate, attractive new website, and a series of stunningly designed and strategically positioned advertisements were placed with the world’s most popular industry publication, Irish Dancing Magazine, both in print and online. What a great year for Sumack Loft! When you’re a solopreneur sometimes it can be feast or famine as they say but I must admit that 2017 was a pretty great year for me. I’m looking forward to what this new year will bring! Do you need to bring in a professional graphic designer for your company branding and promotional materials, in Ottawa or elsewhere? Give me a call! I’d love to chat.